Finished in Windsor Casual on select hardwoods and veneers. 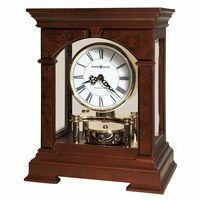 This wall clock offers an Acanthus leaf molding on the pediment and base with reeded columns accenting the sides. 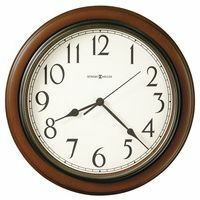 The dial features an aged design and offers an antiqued, brass-finished bezel. Open the front door for easy access to change the batteries or set the time. 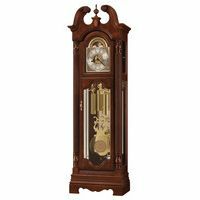 The antiqued brass-finished pendulum behind the door offers a graceful lyre.